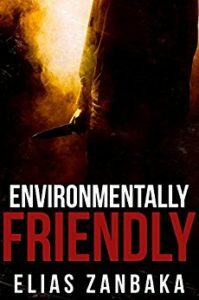 Today I’m reviewing a very short story called Environmentally Friendly by Elias Zanbaka. And out of the entire LAPD , one officer is hell-bent on helping him complete his mission. Environmentally Friendly is a short story of just 29 pages but it certainly packs a punch in those pages. Right from the beginning the reader is thrown into the heart of the action as we follow a mentally ill man taking revenge on Mother Nature, and one cop who is determined to let him have his day. I think I’m not quite the target audience for this story. I like a good thriller but I’m not really into action/adventure reads. However, I think if you like that genre then you would enjoy it as it’s full of action, very intense and very descriptive. It’s quite a unique storyline and a rollercoaster ride for the 20 minutes it takes to read it. It literally never calms down from the first word to the last and the whole thing is rather frenetic. With thanks to the author for the review copy. Environmentally Friendly is available now in ebook for free. I am glad this is getting around! I loved it! And when I found out why he was trying to destroy mother nature, it really moved me!